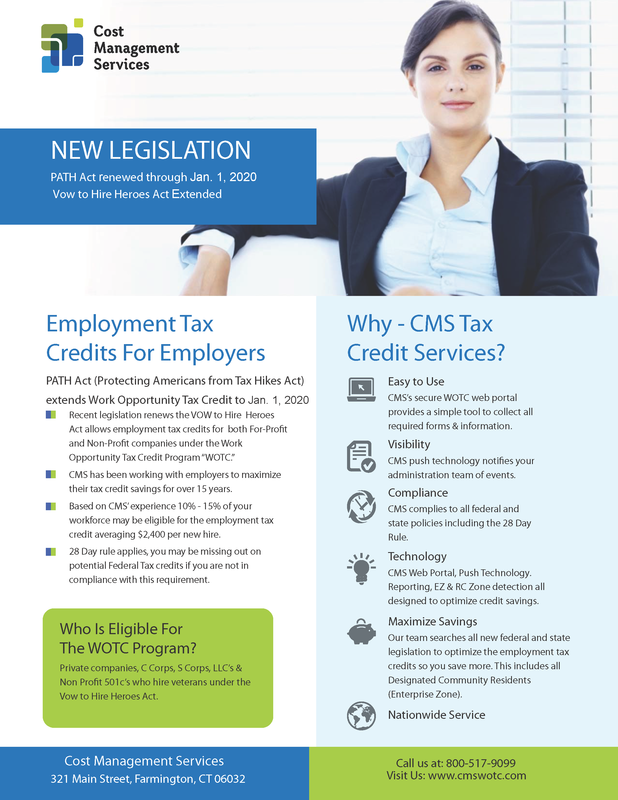 CMS has helped businesses save money by taking advantage of the Work Opportunity Tax Credit for almost 20 years. New Employees apply online via a secure portal, call center or paper. (see WOTC Screening Options). Up to 20% of your new hires may qualify. (see calculator). A potential of $1500 to $9000 in tax credits per eligible employees. (see eligible categories). CMS verifies eligibility and files with the appropriate state agency. CMS tracks the hours and wages of eligible employees to ensure you receive the maximum tax credit available. Vow to Hire Heroes Act. Integrates with your Applicant Tracking Software (ATS) or Electronic Onboarding. Our policy is that we don’t get paid, unless you get paid. We do the work for you. Satisfaction Guaranteed. Don’t leave tax credits on the table. Call a Work Opportunity Tax Credit Expert Today 1-800-517-9099.. If you are an CPA, accounting firm, HR Consultant or business owner, we invite you to partner with CMS to provide WOTC services to your customers. We do all the work for you, and support you during the sales process. Learn more about becoming a partner.